Diabetes in a nutshell: the difference between high and low blood sugar – (Hyperglycaemia and Hypoglycaemia), what is diabetes and how to recognise there might be a problem. First Aid tips and advice for anyone with Diabetes and those who care for them. Going away together – things to think about, pack and prepare. Diabetes is explained in far more detail in our article What is Diabetes. To read more click the link here. But just to recap; it is a condition where someone either doesn’t produce enough insulin, or their insulin isn’t working as it should and so they are unable to adequately regulate their blood glucose levels. We produce the hormone insulin in the pancreas which helps the body to burn off the sugars that are eaten. If the body has problems with insulin production or insulin efficiency, the person will develop diabetes. It is vital that those with Diabetes take additional steps to look after themselves, maintain their blood sugars within normal levels and understand their condition. When blood sugar levels fluctuate and are unstable it can make those with Diabetes more susceptible to infections, feel extremely tired and unwell, lose weight rapidly, need to urinate frequently and it can cause serious damage to vital organs of the body. Family and friends can help people with Diabetes to lead a normal life, whilst maintaining their blood sugar levels within normal levels. It can be particularly difficult for teenagers diagnosed with Diabetes to retain the normality of a teenage lifestyle whilst managing their Diabetes. Diabetic Nurses can be very helpful and support groups are extremely useful to help teenagers cope with the additional challenges. Their friends can be an invaluable support to them and are far more likely to be there with them if there is a problem. It is therefore vital that their closest friends understand about their condition and how to help them if they are unwell. For anyone diagnosed with Diabetes it is a difficult life adjustment and family and friends can be critical in helping people come to terms with their diagnosis and adjust their lives around it. Blood glucose levels can drop very fast if someone who is diabetic has skipped a meal, taken a lot of exercise, if they are ill, or have given themselves too much insulin. If this is not treated quickly, they can rapidly start to lose consciousness and fall into a diabetic coma. This can be fatal. Do not attempt to give an unconscious casualty anything to eat or drink. Never give them insulin as this will further lower their blood sugar and could kill them. If hypoglycaemia was not the problem and you gave a sugary drink, you are highly unlikely to have made anything worse. If you had misdiagnosed and their levels were high not low (extremely unlikely), the glucose you have given them is tiny compared with that in their blood. If they do not feel better once you have given the sugary drink – always contact their diabetes nurse specialist or doctor for advice and encourage them to get checked. Even if someone appears to have recovered, ensure they receive urgent medical advice. This is particularly important at night, as insulin will still be active in the blood stream while they are asleep and the blood sugar levels will therefore drop again and they could drift from sleeping to consciousness. Hyperglycaemia, if you are looking after someone who develops weight loss, excessive urination, thirst and tiredness, these could be symptoms of hyperglycaemia or an indication of Diabetes and they should visit their family doctor as a matter of urgency. Phone for an ambulance: if they deteriorate quickly and begin to get drowsy or start to lose consciousness. Hyperosmolar Hyperglycaemic State (HHS) is a serious condition that can occur in people with diagnosed Type 2 diabetes who experience very high blood glucose levels (often over 40mmol/l). It can develop over a course of weeks through a combination of illness (such as infection) and dehydration. Stopping diabetes medication during illness (such as swallowing difficulties or nausea) can contribute, but blood glucose often rises despite the usual diabetes medication, due to the effect of other hormones the body produces during illness. Hospital treatment for HHS aims to correct dehydration and bring blood glucose down to an acceptable level by giving replacement fluid and insulin by an intravenous drip. It does not usually lead to the presence of ketones in the urine, as occurs in diabetic ketoacidosis(DKA), which is why it was previously referred to as HONK (hyperglycaemic hyperosmolar non-ketotic coma). Ketones develop when the blood glucose level is high due to lack of insulin which is needed to allow glucose to enter the cells for energy. Because people with Type 2 diabetes may still be producing some insulin, ketones may not be created. Diabetes increases an individual’s health related risks. Those with diabetes are more prone to infections and minor injuries need to be cleaned, dressed and checked appropriately and regularly. Encourage your diabetic friend or relative to explain how they feel when their blood sugar goes low (or high) and teach you how to monitor their blood sugar if they are unable to do so. Understand how to read the result and what needs to be done. Ask your diabetic friend or relative to share their emergency diabetic nurse specialist number and gain their permission to save this on your phone along with GP and hospital consultant information. Ideally the diabetic patient should wear a medic alert bracelet – ask them to explain what information is contained on this and how to access it. If you are going away together, ensure you all have an appropriate first aid kit along with an emergency diabetes kit. Your first aid kit should contain materials to clean a wound and dress it. Wounds should be cleaned and dressed promptly and checked regularly for any signs of infection. The emergency diabetic kit should contain: specific information on their condition, the glucose monitoring device and advice for a lay person needing to use the monitoring device and identify whether blood sugar levels are low or high. The kit should also contain glucose tablets – or equivalent to boost your blood sugar if it has dropped, gloves and lancets to take the blood. 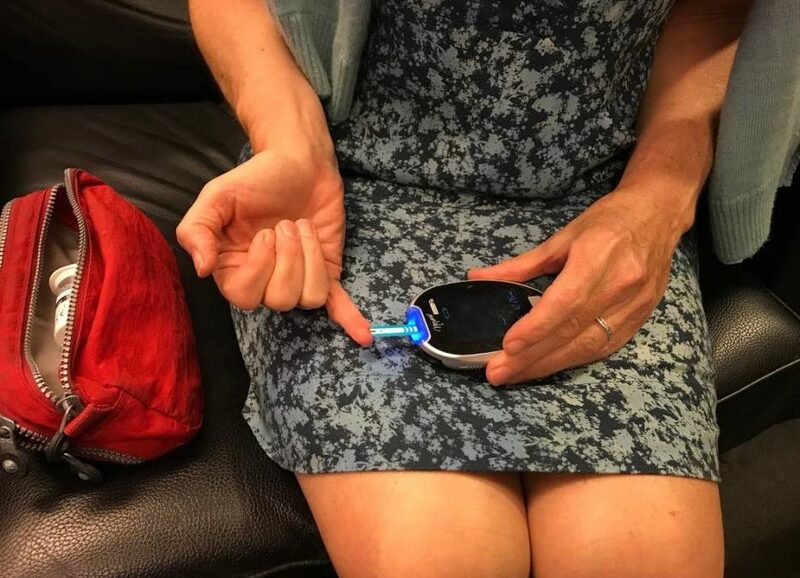 Depending on the diabetic management, it may be necessary to travel with glucagon and insulin – this should be refrigerated (or in a cool bag) and very clearly marked to ensure no one attempts to give insulin in a diabetic hypo as this would prove fatal. Ensure there is at least a three-day additional supply of all diabetes medications as well as sufficient medication for the duration of the holiday. Travel with prescriptions and details in case there is a problem and the medication needs to be replaced. Check expiry dates regularly and return expired medication to the pharmacy. Keep medicine in the original containers. If flying, always carry your medication in hand luggage in case on-board baggage goes missing. Insulin needs to be refrigerated, so cannot be stored long-term in the diabetic emergency kit. However, for travel purposes insulin can be stored in an insulated bag. Insulin should be kept in an appropriately marked bag in the refrigerator. Airports will need medical details to explain why someone is travelling with medication and needles and requires this on board the flight. Doctors and Diabetic Nurse Specialists can provide this paperwork prior to travel. Ensure they have all the details and sufficient time to prepare this.